Charles Allchin signed the 1853 Bendigo Goldfields Petition. 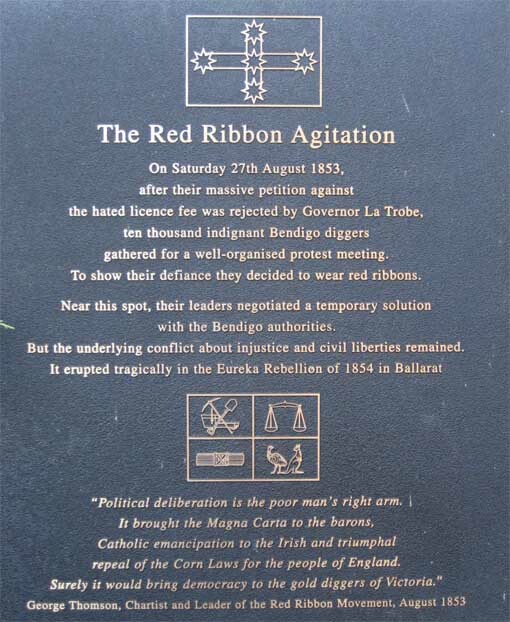 Agitation of the Victorian goldfields started with the Forest Creek Monster Meeting in 1851, but what became known as the Red Ribbon Movement was centred around the Bendigo goldfields in 1853. The Anti-Gold License Association was formed at Bendigo in June 1853, led by George Thomson, Dr D.G. Jones and 'Captain' Edward Browne. The association focused its attention on the 30 shillings monthly licence fee miners were required to pay to the government. They drew up a petition outlining digger grievances and called for a reduced licence fee, improved law and order, the right to vote and the right to buy land. The petition was signed by diggers at Bendigo, Ballarat, Castlemaine, McIvor (Heathcote), Mount Alexander (Harcourt) and other diggings. The 13 metre long petition was presented to Lieutenant-Governor Charles La Trobe in Melbourne on the 01 August 1853, but their call for a reduction in monthly licence fees and land reform for diggers was rejected. The diggers dissatisfaction erupted into the Red Ribbon Rebellion where agitators wore red ribbons on their hats symbolising their defiance of the law and prohibitive licence fees. Signed the Bendigo Goldfields Petition. This page was last edited on 23 February 2019, at 13:42.